The Gobi March in Mongolia, part of the 4 Deserts Race Series from Racing the Planet, is a 250km / 155mile self-supported footrace that will take place this July. Over the course of seven days, temperatures will range from 5-35°C / 41-95°F during the day and as low as 0°C / 32°F at night; Time Magazine named this race one of the Top 10 Endurance Competitions in the world. Free to Run is very pleased to announce that we're working with two of our core Afghanistan team participants to train for The Gobi March, with the goal of becoming the 3rd Afghan team to finish a gruelling international ultra. When we opened the application process this past February, we asked Free to Run’s core team participants to write an essay or create a video if they were interested in joining the two-person team, explaining why they should be selected and what they would contribute. 23 of our 45 core team participants, across three provinces, applied for the race. Based on their commitment to practice, teamwork, and volunteer leadership roles within other Free to Run programs, Community Development Team leaders Hasina and Zeinab were the two runners selected for the Gobi Desert March team. This is a one-minute speech from one of the winning applicants about why she would like to join the Gobi team in 2018. “When I heard that I was selected for the ultramarathon, I was surprised! I started worrying whether I could really finish my first ultra,” said Hasina. Hasina is 23-years-old and teaches the Life Skills through Sports curriculum and a sports session twice a week. She has taught over ten girls how to ride a bicycle, as well as introducing them to a variety of other sports. Zeinab, also 23-years-old, leads another Community Development Team within one of our partner universities. 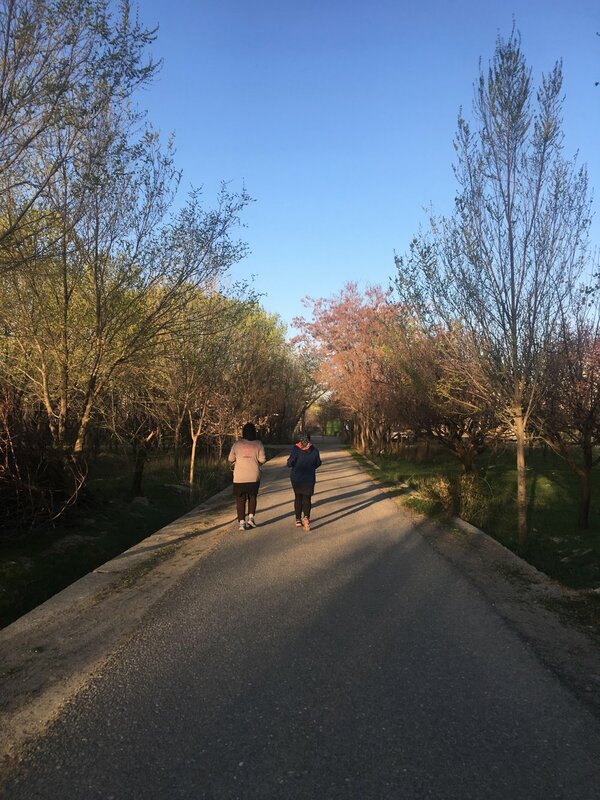 She encourages young women who attend the university to join her running club on school grounds, where all students can see Afghan women participating in outdoor sports activities. She has also organized two races at the university with the help of Free to Run. Zeinab and Hasina leading a volunteer session in 2017 with one of Free to Run's partner organizations. Following the 3rd annual Marathon of Afghanistan last October, practices were reduced to two running sessions per week due to the cold weather and winter air pollution. The first month of training focused on getting the team back into a regular running routine. At the end of the month, both Zeinab and Hasina were feeling much more positive about their ability to finish the ultra marathon. “I get positive energy from my partner, because she wants to run the ultra with me,” said Hasina. The team is fortunate enough to have training plans developed by Andy Dubois, an accomplished Australian ultrarunning coach. As the kilometers and practice sessions increase, the team is also focusing on what completing this ultra marathon will mean for young women in their country. If you would like to support the team in their quest to complete The Gobi March, you can make a donation towards their visa, travel, training, transportation and gear expenses on their Crowdrise fundraiser page. Stay tuned for updates on their training and progress as we count down the days to this epic race!